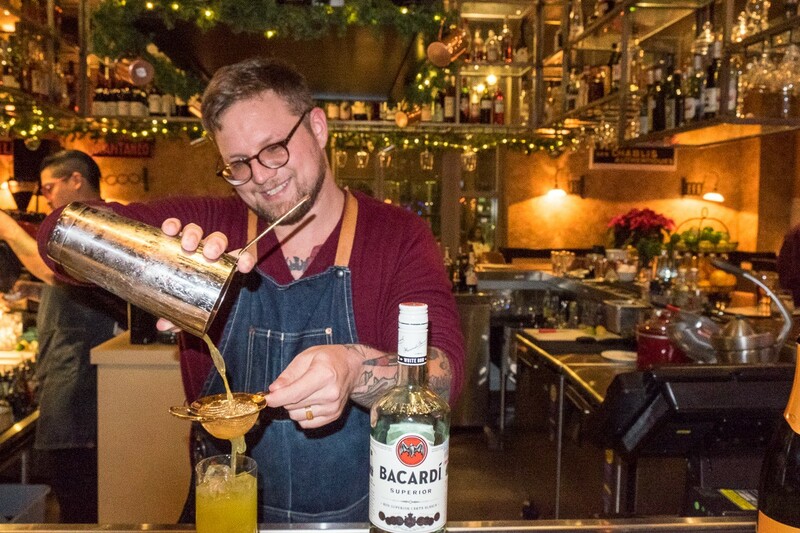 Bacardi Legacy finalist and Houston bartender Chris Morris making the Regalo cocktail during a one-night showcase at Brasserie du Parc. Photo by Phaedra Cook. Chris Morris is familiar to many diners as the former bar manager at now-closed Hunky Dory and for his previous work at Bar Milano in Hotel Sorella, just underneath restaurant Radio Milano. Hunky Dory closing meant he’s had time to focus on other ambitions, including consulting and winning the regional finals of the Bacardi Legacy Global Cocktail Competition in November. He advanced to the national level competition, which starts in Miami next week. This isn’t his first time as a major competition finalist. Morris had previously traveled to Puerto Rico for the Heaven Hill Bartender Of The Year finals and to London for Bombay Sapphire’s Most Imaginative Bartender competition. While he’s come close to grabbing top honors in multiple competitions, it hasn’t quite happened yet. That’s why he’s asking for Houston cocktail fans to lend some help before the Bacardi Legacy national showdown in Miami next week. It’s easy: buy the cocktail, try it and then post about it on social media. 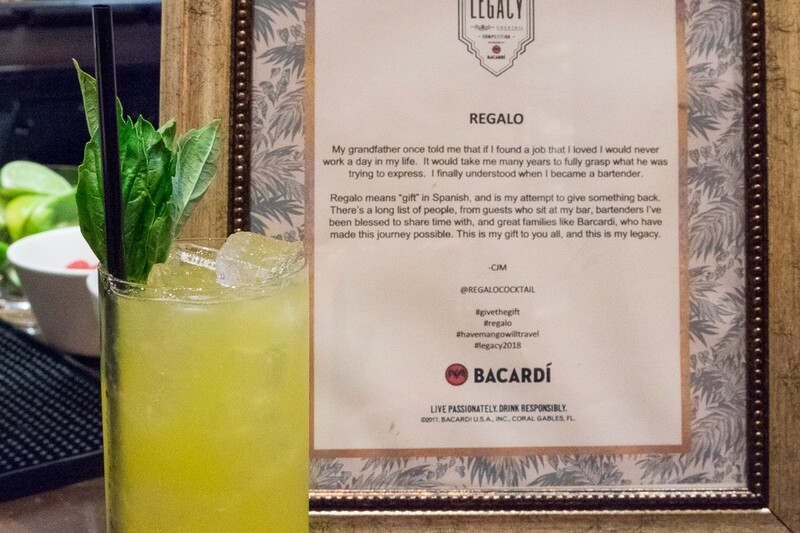 Chris Morris’ Regalo cocktail, the regional winner in the Bacardi Legacy competition. Photo by Phaedra Cook. Morris’ winning cocktail is named Regalo, which means “gift” in Spanish. It’s made with Bacardi Carta Blanca rum, mango nectar, simple syrup, fresh basil and Champagne. Part of the challenge for each finalist includes marketing the winning cocktail. To that end, Morris created an Instagram account for the cocktail and is appearing at various venues around Houston so that people can try it for themselves. Those who post about the Regalo on social media can also use these hashtags: #givethegift, #regalo and #havemangowilltravel. After the Houston cocktail showcases, Morris has to travel to Miami to give his marketing presentation on February 5 and the final cocktail presentation is on February 6. The top two contenders will get to go to the global Bacardi Legacy competition in Mexico City next May. While guests try Morris’ cocktail, they can also help Puerto Rico—the home of Bacardi—which is still devastated after Hurricane Maria. When Morris recently visited, he saw the devastation for himself and the couple wanted to do something to help. Recent news reports state that over 450,000 citizens are still without electricity. Morris and his wife, Samantha, made candles with primary mango and basil scents that mimic how the Regalo cocktail tastes. The cost is $5 each and two dollars of every sale goes to hurricane relief. I recently tried this cocktail, loved it! Very balanced and refreshing, can’t wait to get a candle so my house will be tasty too…..?